CSR is not a thing, a report or a website you can add to your business, it has to be in your DNA. If not, don’t report on it, you will not be believed anymore. In old stakeholder models, the company is in the middle of the charts, in our networked soceity a company might be included in the network of a stakeholder, but certainly this is not automatically. Stakeholders choose whether a company is part of their network. Being part of the network depents on trust and reputation. Trust is earned because you are trustworthy, reliable and stakeholders believe what you are saying. For VW this is the biggest problems. They did not tell the truth, are not reliable and lost their trust. Being distrusted makes that one of the fundamentals of reputation is being destroyed. Building this again will cost years, if it is possible at all. CSR has to be in the DNA of a company. The various responsibilities of organizations (from economic, legal, ethical and philanthropical) shows that VW Dieselgate crisis is not a CSR crisis, it is an ethical and legal crisis, caused by lying and explicit cheating. If you lie and cheat, your CSR reports, websites and other communications will not be believed, will make increase the distrust. What should Volkswagen do? First they have to stop immediately with all commercials and advertising campaigns, it is a waste of money. Second think about a major compensation, like replacing all diesels with the particular software by electrical or hybrid cars. 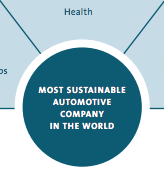 VW did make a promise, to be the most sustainable automotive company in the world, it is now to proof this promise. Stakeholders will leave, they have the opprtunity to do so, and have the freedom to be no longer your stakeholder, whether they are a customer or an investor. It’s not the issue whether the reputation of VW will be restored or whether they will regain trust, it is how to get back stakeholders, who have been cheated. This is the big challenge of VW and the automotive branche, and they cannot tell another lie or cheat the way they did in Dieselgate. VW has overcome their wrong doings in WWII, but I am convinced that this is a much bigger challenge. At least they bring us in corporate communication and CSR communication very interesting case material. I can’t wait until the publication of their 2015 CSR report and read another fairytale?